The Future of Mental Health drills to the heart of the current mental health crisis, where hundreds of millions of individuals worldwide receive unwarranted "mental disorder diagnoses." It paints a picture of how mental health providers can improve their practices to better serve individuals in distress and outlines necessary steps for a mental health revolution. Eric Maisel's goal is to inject more human interaction into the therapeutic process.Maisel powerfully deconstructs the "mental disorder" paradigm that is the foundation of current mental health practices. The author presents a revolutionary alternative, a "human experience" paradigm. He sheds a bright light on the differences between so-called "psychiatric medication" and mere chemicals with powerful effects, explains why the DSM-5 is silent on causes, silent on treatment, and wedded to illegitimate "symptom pictures." 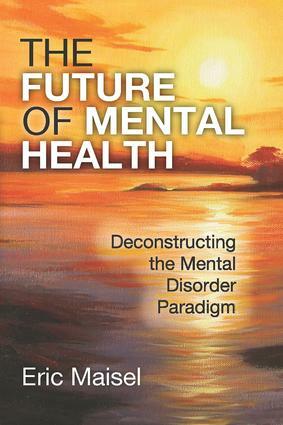 Maisel describes powerful helping alternatives like communities of care, and explains why one day "human experience specialists" may replace current mental health professionals.An important book for both service providers and service users, The Future of Mental Health brilliantly unmasks current mental health practices and goes an important step further: it describes what we are obliged to do in order to secure better mental health services�and better mental health�for everyone.